Part of the show Why's Graphene Great? Dave - Graphene seems to be a very versatile material that we should soon see turning up in a range of applications. Now we're joined by James Tour who is Professor of Chemistry, Mechanical Engineering, Material Science, and Computer Science at RICE University which is an incredibly impressive list. James, thanks for joining us. So, what is it about graphene which makes it so useful? What are its properties? James - Well, it is certainly projected to do many things. I think certainly from an electronics perspective, it can carry an enormous amount of current, far more than copper or gold for similar sized structures. It has a very high mobility which means that you could build very fast switching devices, and that's really important if you want to be able to do high performance computing. The numbers are just frighteningly high. 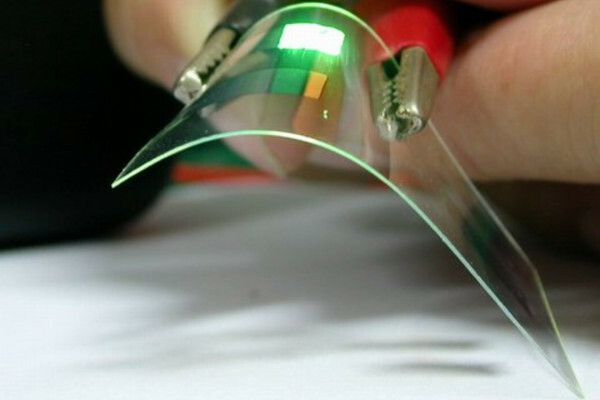 If you consider a mobility of about 500 per silicon, graphene has been shown to be up around 1 million. So, it could operate with much faster switches, and then also on the display side, but then also working in conjunction with fluids. Dave - So you were talking about mobility then. What actually is mobility? James - So, I guess a way you can imagine this is if you switch a device and you move the carriers all in one direction so they're propagating across, you have to wait for those carriers to get across to get your message across the silicon. So you can't switch it back the other way until the carriers have gotten all the way across in one direction. So there's a time delay. You can't switch it as fast as you'd like. You have to wait for things to get across it. But if things can get across extremely rapidly, then you could keep switching far more rapidly and you could build much faster switches. Dave - So, a major limit on the speed of a computer chip at the moment is just the time it takes for the signal to get from one side of the transistor to the other side of the transistor and graphene you say was more than a thousand times faster than silicon. So, how difficult is it going to be to build a computer chip out of graphene? James - Well, you can certainly build one transistor. Lots of people are doing that, but certainly in our computers, we have billions and billions of these, tens of billions, hundreds of billions of them. So, nobody has solved this one yet, but the nice thing about graphene which you could not get with carbon nanotubes is that graphene, if you make a sheet of it, you can chop it up using resists and light, much like you do with silicon, so you can pattern in that way. So you make a large area and you chop it up into the smaller pieces that you want, and that's something you could never do with carbon nanotubes. The problem still remains however in that it is a planar structure and generally, what you want to be able to do is build vertically. So it's analogous to having straws. If your straws were laid out on a surface, you could only get so many, but if the straws are standing up, you could pack a lot more and right now, silicon is assembled vertically and not horizontally so that you can get more on a chip whereas graphene is predominantly horizontal, and that's the way it's going to be until we get better at growth methods and transfer methods that might allow it to be vertical. So, there's still many hurdles that need to be done before this is going to begin to rival silicon. Dave - So at the moment with graphene, even something as simple as making one wire across another would be very difficult. James - No. You can make one wire across another. Graphene would be good for that, but in a vertical array like silicon, then it's hard. But that's taking on silicon at the high end electronics and that's not really fair to graphene because silicon has had 50 years of work on it and that is probably millions and millions of person years put into it, and many, many trillions of dollars or pounds put in to it. So, there's a lot of development that's got into silicon. Graphene has a fundamental property that's really quite amazing and in lower level applications, it's going to compete quite well, such as in the touch screen displays that we've heard about, being able to roll these things up and fold them up which would be quite nice, so that when you drop your iPhone, you don't have a cracked screen which is a real headache for the user. Dave - Because up until now, the standard transparent electrode is indium tin oxide, it is sort of ceramic, isn't it? It's very brittle whereas I guess graphene is so thin that it's got to be flexible. James - Yes, it's flexible and so that you can put it on a flexible substrate, so that you can think of rolling up your iPhone and putting it behind your ear like a pencil or whatever, and walking away. I mean, that's certainly the possibility. Dave - So you can actually make all of electronics with graphene. I mean, graphite behaves like a metal. It just conducts electricity, so can you turn graphite into a semi-conductor as well as conductor? James - That's a good point. Graphene is a metal and it has a band gap that's zero or near zero so, you have to turn it into a semi-conductor. That can be done by putting in impurity atoms into it and then you can begin to open up a gap. We don't have the absolute control over that quite as we would like, but researchers are getting better at that all the time. So, I think that that's going to open up, but again, I don't think that that's going to be the forefront of applications and I think that applications are going to insert in an even easier market than mainstream electronics. Dave - So, this is going to build the transparent stuff. In fact, Barry Freeman was saying, "Is graphene going to be commercially viable any time soon and when will we likely see it be used?" James - Well again, I think some of the simpler applications are for example, one of the things that we're working on were taking both graphene and the oxidised version of it, graphene oxide, and putting it into drilling fluids, fluids that are used to drill holes in the ground where they find oil. And one of the problems is the fluids infiltrate the rock and then when you try to yield the oil from the rock, the rocks have often been plugged and they have to go back in and try to wash these fluids out. We found that if we could add the graphenes in oil based drilling fluids or the graphene oxides in water based drilling fluids, these act as little nanofilters and keep the drilling fluid from infiltrating the rock. This is a very simple application, so any time you're talking about nanotechnology, you have high level of applications and then you have simpler applications. So you have both active applications where you're asking a lot of the material, asking it to have mobility, asking it to accept an electron and spit out a photon for example, or you have passive applications where just its mere presence, acts as a filter or something. It's a very passive application so it can insert far more easily into the industry, and I think that that's where we begin to see the initial applications. So again, a composite is a passive application, its presence being there, causes the composite structure, the molecules and the composite generally to be stiffer because they have to align past the nanostructure, and that increases the performance of the composite in that way. So the simpler applications will always insert first. Dave - Brilliant! Thank you very much, James. That was Professor James Tour from the RICE University. Which 2 Equations Did Einstein Discard and Why? What is longest random computer password that can be resolved? Black Hole - Infinitely slow Super nova?